Prince John gets all of the best stuff. Gouda cheese, pumpernickel bread, green apples. All of these things are banned for sale to the common folk. But the problem is, common folk are your best customers. They're also your only customers, since Prince John isn't about to shop at some lowly market stall. Watch the video and learn just how you can sell tasty pumpernickel bread and make a few coins in the proccess. 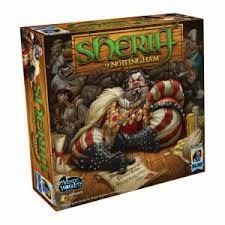 Find out more about Sheriff of Nottingham at the Arcane Wonders website. Randy Navarro still doesn't understand why a lion would ever want gouda cheese. It's one of the great mysteries, here in Dallas, TX.